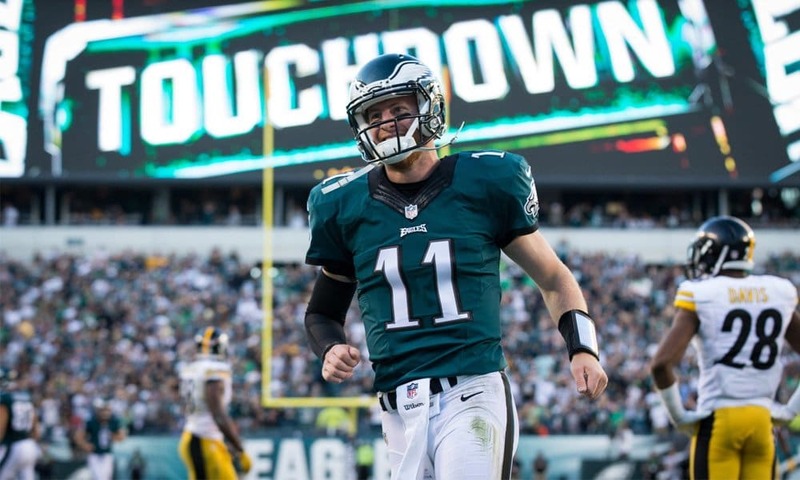 We break down the top ten quarterbacks in dynasty fantasy football. I genuinely love each and every part of what I do here at Dynasty League Football. That’s the truth. But if there’s one thing that drives me a little bit nuts, it’s splitting hairs in rankings. It is by far the most difficult part of writing articles like this. That’s why I’ve used two weapons to my advantage. By creating tiers, and slipping in two extra signal callers at tied-tenth, I hope I’ve made the rankings not only more accurate but easier to digest. Please keep one vital thing in mind when going through these rankings: The tiers are much more important than the actual numbers, especially in tier three. Let’s get into our Top Ten Dynasty Fantasy Football Quarterbacks. This series will take us through the top ten of the four major positions and will be updated every July and January. Consider this the 2018 preseason Edition. Carson Wentz brings just about everything to the table. Youth, talent, production, and situation. It’s all there for the third-year Eagle. Maybe I’m getting overconfident, but post-ACL injury, I don’t think Wentz will miss a beat. Yes, some of his incredibly good numbers from 2017 will almost have to decline. But looking ahead, he’s the surest bet to be a long-term force at the quarterback position. How can you have Winston on the Top 10 and not Stafford? Winston will never be a Top 10. Off-field issues aside, he is not in the conversation for Top 10 QB in Dynasty. He is a floor player with an unpredictable ceiling. In my Superflex, I would not have him. I understand your concerns with Winston. His off the field issues are frustrating, and as you said, he’s never been a top ten quarterback. However, I still think the potential is very much there. At the very worst, he’s a long time solid QB2. And at his best, I think he can be a top seven finisher. It will certainly be interesting to track his career. Thanks, Leo! I appreciate the differing opinion! Patrick Mahomes has no business being on this list. I do like his chances, but let’s see what he can do in a full season before he’s anointed a top 10 dynasty QB. When I read your comment, I started researching QBs first 3 years and at least 20 minutes into the research, you’re right about the 4,000 yd thing. That surprised me, but so did Winston’s TD% which ranged from 4.1%-4.9%. I’ll admit that I never really wanted much to do with him, but maybe I should revisit this! One QB I don’t see the potential in is Mariota. His 2016 season was a nice display of what he can do, but last yr with a TD/INT ratio of 13/15 has me worried. Still super young, I just don’t ever see the the gaudy yard totals to assist in years he’s not throwing a sufficient of TDs. I’d like to see Stafford on these top 10 lists as his floor is high, and his ceiling is higher than given credit for (see 2011). Hopefully with the pieces added to the run game in Detroit, Stafford will have more efficient throws. Yards may go down some, but I can see more TDs, less INTs, and more fantasy points. We will see (I’m a sad Lions fan). Thanks for the comments, Adam and Jason! You guys made a lot of great points. I appreciate your view on Rodgers. You’re not alone in this opinion. I think people view Wilson and Wentz as close enough to Rodgers in terms of production, that taking their youth just makes too much sense. Building for a three-year window isn’t a bad strategy, but if you can, taking a player who could be dominant for 5-10 years is well worth it. As for Winston, I think we need to see him put up a QB1 season before we’re elevating him any higher than T-10. His passing numbers are impressive, but he’s so unproductive as a runner (except rookie season), that his season finishes have yet to be noteworthy. I understand the hesitation to place Mahomes in the top ten. He’s only played one NFL game and didn’t exactly put up monster stats in it. A lot of his value comes down to his upside, rather than his floor. I truly believe Mahomes has the potential to become a perennial top seven QB. As you said, Mariota’s 2017 was extremely discouraging. If he puts up a similar year in 2018, there’s no way he’ll be on this list in January. Luckily, I don’t think that will be the case. With a strong supporting cast and hopeful improvement of Corey Davis, I think Mariota will bounce back. You’re not the first person to tell me I needed to put Stafford on this list. Believe me, he was a heavy contender. If I could have put one more quarterback on this list, he and Dak Prescott would have been battling it out. As you said, he’s got one of the better floors in our game. He should be in for another very solid season in 2018. The upside of Lamar is to tantalizing to not have him over guys like jimmy G , Jameis and Mariota . Those guys have been in the league long enough and still have just as many question marks from a fantasy perspective as Jackson who hasn’t even played a game. I enjoy your articles but respectfully disagree here . I’d take jackson over those 3 in a dynasty startup 7 days a week and twice on Sunday just based upon IF he hits bc its Watson Esque upside we are talking about . Hey Chris! Thanks for the comment. I appreciate your belief in Jackson. In this rookie class of QB’s, he very well could have the highest upside of them all. I really wish he would have landed in a different situation, surrounded by better talent. Baltimore has Michael Crabtree and Alex Collins, but it’s not exactly Kansas City. If can A) Start at least a handful of games and B) Perform at a QB1 level, there’s no reason he can’t end up on the January edition of this list. Haha thanks for the comment Matthew! Quite a few people have told me that I should have included Stafford on this list. And trust me, he wasn’t far off. I could totally see why someone would rank him as a top ten dynasty QB, but I just think the cases of Goff, Winston and Mahomes are more compelling. It’ll be interesting to see how this list changes by January. I have Wentz and Jimmy G on my Superflex roster. Was offered Wilson for Jimmy G and a late 2019 1st (I have 4 2019 1sts total). I almost took it in a heart beat, but then remembered that SEA has B.S. for an OC…literally and figuratively. I love the prospect of having Wilson and Wentz on my team, but I am hesitant because of the new OC. Is Wilson that much of an upgrade over Jimmy G? Is it worth it to have two Tier 1 QBs? Hey Steven, thanks for the question! My advice is to absolutely, 100% take that trade. Wilson is arguably a top ten asset in Superflex, and getting him for Garoppolo and a late 2019 first is a steal. Pairing him with Wentz will be scary good. Take that trade ASAP. To answer all three of your questions, yes. Wilson is OC proof, he’s a considerable upgrade over Garoppolo, and while I understand the concern, having two tier one QB’s is worthwhile in Superflex. With Wilson and Wentz in tow, you should be a contender for several years. Loved the questions, thanks for reaching out, Steven! I hope that trade can be completed!